A planned rush hour strike by Virgin Trains booking office staff at five mainline stations has been called off. Transport Salaried Staffs Association members were to strike on Friday night at London Euston, Birmingham New Street, Coventry, Preston and Glasgow. Virgin Trains said the strike was abandoned after legal advice questioned the ballot procedures. The union said Virgin Trains was planning to close several ticket office windows, a claim the firm denied. About 100 members of the Transport Salaried Staffs Association (TSSA) union were expected to have taken part in the strike. They claim Virgin plans to cut back on the number of ticket windows open to the public which would force people to use more expensive ticket machines. 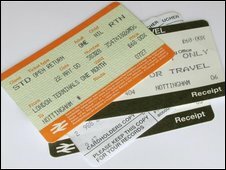 Gerry Doherty of TSSA said: "If this goes ahead we could end up with 10% fewer booking office staff," he added. However, Virgin Trains said this claim was "bizarre" as it had no intention of reducing ticket office windows or staff. Virgin Trains chief executive Tony Collins criticised the union. "It is shameful that the TSSA leadership has deliberately confused its own members and our customers over what the dispute is about," he said. However, Mr Doherty responded: "We are very disappointed that Virgin have left it to the last minute to resort to anti-trade union legislation to challenge the legality of a ballot which saw a 70% majority in favour of strike action." He added the union did not want to fight the issue in the High Court but instead wanted to negotiate directly with Virgin.